Mancini, S. and Solioz, M. (2015). Determination of Quinone Reductase Activity. Bio-protocol 5(17): e1581. DOI: 10.21769/BioProtoc.1581. We recently demonstrated the presence of a quinone detoxification pathway present in Firmicutes. It is based on two enzyme activities, namely a quinone reductase, YaiB, described here, and a hydroquinone dioxygenase, YaiA, described in a separate protocol. In Lactococcus lactis (L. lactis), these enzymes are encoded by the yahCD-yaiAB operon. The operon is induced by copper to prevent the synergistic toxicity of quinones and copper. The quinone reductase, YaiB, reduces p-benzoquinone and a range of quinone derivatives to hydroquinone, using NADPH as a reductant, according to the reaction: p-benzoquinone + NADPH + H+ → hydroquinone + NADP+. We here describe the measurement of quinone reductase activity, based on the spectrophotometric measurement of NADPH-oxidation. Quinone reductase purified from Escherichia coli (E. coli) by Ni-NTA chromatography as described in Mancini et al. (2015). Note: optionally other quinone substrates like 1, 4-penzoquinone, 2-methyl-1, 4-benzoquinone, 2, 5-dimethyl-1, 4-benzoquinone, menadione, naphthoquinone, or 2, 6-dichloro-1, 4-benzoquinone, all available from Sigma-Aldrich. Mix 970 µl of 20 mM Tris-Cl (pH 7.5), with 10 µl of 100 mM NADPH (final concentration 1 mM) and 10 µl of 100 mM p-benzoquinone (final concentration 1 mM) in a cuvette and equilibrate at 30 °C. A linear absorbance change should be observed within a few seconds. Let the reaction proceed for 5 to 10 min or until a steady reaction rate is observed. Calculate the activity as nmol/min, using an extinction coefficient for NADPH of 6,220 M-1 cm-1. Both, NADPH and quinones are substrates of the enzyme reaction. NADPH is the reductant and quinones are the substrates being reduced. To determine the Km for a substrate (either quinones or NADPH), run enzyme reactions with one substrate at 1, 3, 10, 30, 100, 300 and 1,000 µM, while keeping the other substrate at 1 mM. Determine the initial reaction rates, v0, from the slopes of the earliest linear regions of the recordings and plot v0 versus the substrate concentrations, S.
Fit the curve to obtain the affinity for the substrate, Km, and the maximal velocity, vmax. Alternatively, plot v0 versus 1/S to obtain a Lineweaver-Burk plot, from which Km and vmax can be determined. Figure 1. Representative data. Hanes-Woolf plot of p-benzoquinone reduction by YaiB of L. lactis. [S] is the mM substrate concentration and v the reaction rate in mmol/min. 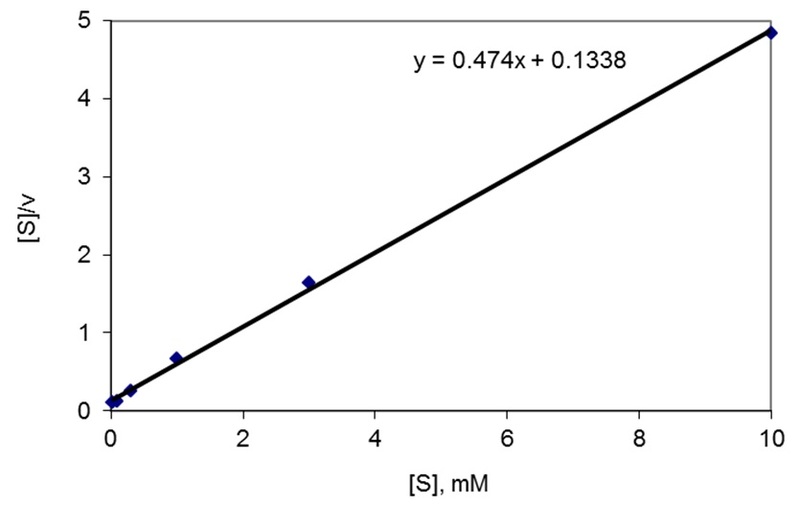 The slope of the linear regression line equals 1/vmax: vmax = 1/0.474 = 2.11 mmol/min/mg. Km is defined by the intercept of the regression line with the ordinate, which equals Km/vmax: Km = 0.1338*2.11 = 0.28 mM. Quinone reductases are flavoproteins which lose their cofactor quite readily; therefore, all the buffers used for purification or dilution of the enzyme should be supplemented with 10 µM flavin mononucleotide. NADPH tends to auto-oxidize to NADP in the presence of oxygen; therefore, it must be prepared fresh. Prepare fresh on the day of use. How to cite: Mancini, S. and Solioz, M. (2015). Determination of Quinone Reductase Activity. Bio-protocol 5(17): e1581. DOI: 10.21769/BioProtoc.1581.